There are some fantastic birthday party options for kids in Calgary (including one of our awesome soft play parties, of course!). But no matter what you choose for your child’s birthday, this two part series on birthday party planning should help you pull off a fabulous event without all the stress! In Part 1 we covered timelines and tips for guest lists, Calgary venue selection, birthday party themes and party invitations. If you missed it, you can read part 1 here. Don’t want to have to spend the birthday party day in full time party host mode? Having a Sprog & Sprocket birthday party is all the activity you need! We create birthday party spaces like no one else in Canada – let alone Calgary – and every client we’ve had has said the same thing – how much the grown-ups got to enjoy the birthday party because the kids were entertained the ENTIRE time! Leave the cat herding to the professionals >>> watch them here. It’s some of the best 60 seconds on the internet! Just because you don’t have to host birthday party activities, doesn’t mean you don’t want to. If you’d like to have some birthday party activities start the planning at least 4 weeks in advance; this gives you plenty of time to plan and source any materials. When it comes to entertaining kids at a birthday party, there’s no shortage of choice. A quick pinterest search and you’ll find a ton of ideas! and of course the games! So how do you keep all your little people having fun and stay relaxed enough to enjoy the day yourself? For the four and unders especially, if you’re doing a craft, remember at this age it’s about the process more than the product. Don’t be crushed if the little’s aren’t producing the works of art you’d dreamt up in your birthday party plan. Also, be ready for a few non-crafty types and have a plan to keep them out of trouble. For party games, generally the less explanation you need to give the better, so think musical chairs, red light green light, pin the …something on the …anything. Over at Celebrate the Big and Small they’ve done a great tutorial for a ‘punch box’ – a really fun alternative to the classic bat-swinging piñata. Twister, scavenger hunts, marco polo, and egg on spoon obstacle courses are some other great activities for the 5 and overs. There are so many options and choices when it comes to birthday party decorations these days. Do you use so much Disney it makes you dizzy or catalogue ready petit-chic? Trying to find a happy medium of kid-friendly style? Take inspiration from your child’s favourite toy/character/show at the time (they probably gave some input here when you decided on your theme) then pull it together with stylish décor from the same colour palette. Don’t feel too much pressure, there isn’t a right or wrong with this, a birthday party that you’ve poured love into is a birthday party that your child will love and remember. If you’re going to pull out some DIY Pinterest mastery, decide on those projects as early as you can and get started! Or call on your favourite crafty person and delegate a few projects their way. Give yourself AT LEAST 3 weeks before the birthday party to plan or order the cake – whether you’re ordering it or baking it yourself, you will want time to shop around, be it for a baker/bakery or for your own supplies. 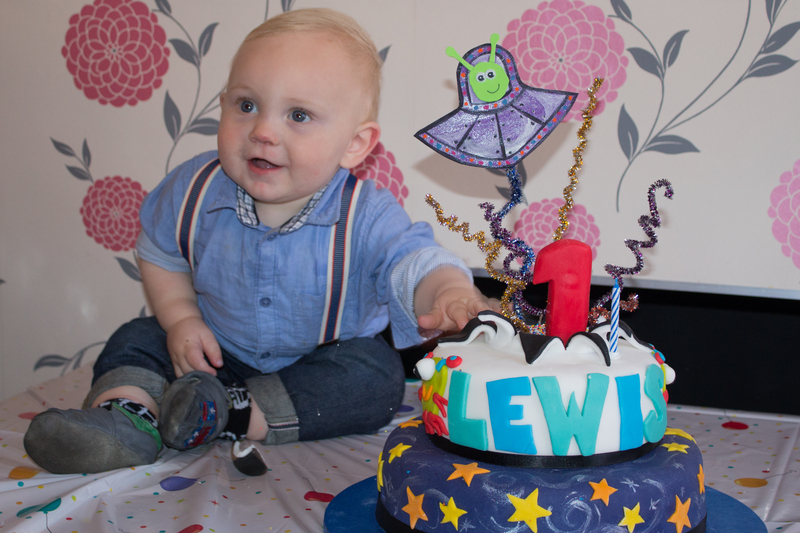 I must confess, I love making my son’s birthday cake and I always will, but for his very first birthday party – I got soooo excited planning this two-tiered alien cake that I didn’t have time to BAKE THE ACTUAL CAKE and still have enough time to decorate it! SO my inner problem solver hightailed it off to Costco and bought a couple of their pre-made cakes. I came home, scraped all the shop icing off and went on to re-ice and decorate as planned! The cake tasted delicious, I got loads of compliments, and I managed to just about look like I knew what I was doing….until now. Whether you do the food yourself or get outside help, think easy eating. Birthday party food should include stuff that can be picked up with fingers and eaten in a bite or two. It’s the perfect way to keep tummies from growling as the kids play and adults mingle. and rightly so, they are beautiful! The talented Poonam of @sugarshimmer is an incredible cookie artist right here in Calgary so if you want to add something extra special to your desert table I’d recommend you check her out here on Facebook or here on Instagram. keep in mind any allergies – you might want to skip the PB+J for example, unless you’re confident your guests are allergy free – better yet, ask your guests to inform you of severe allergies when they RSVP. For sure this is Simon’s domain in our house. I love music but I have absolutely zero music literacy; the only thing I do know is that it ain’t no party without it! Keep everyone bopping along by including a mix of kids songs and some upbeat kid-friendly stuff that the adults can enjoy. (Simon is working on a post with some non-cringey, happy-parent playlists for kids parties, so watch out for that one if you’re like me and need some musical guidance). Until then, check out this post from Fatherly for enough kid’s songs to get you through your birthday party! I’ve seen a few questions roaming around about whether favour or party bags are still a ‘thing’ or if parents can skip over them. Maybe it’s nostalgia but I can’t help thinking a kid’s birthday party isn’t complete without a little goodie bag for the wee ones. You’ll have to decide what works best for your birthday party – but one things is for sure; the excitement the kids feel when they receive their little bundle of treasures is undeniable! Give yourself time to think about what you’d like to put in your goodie bags, if you’d like them to match your party theme, how you’ll package them and of course, time to shop around for any supplies and all the goodies! Candy necklaces or watches, pop rocks, suckers, tootsie rolls, button candy, pixie sticks, stickers, temporary tattoos, novelty erasers, crayons, mini pencil crayons, bouncy balls, slap bracelets, bubbles, notepads, music makers, sticky hands, mini yo-yos, mini rubix cubes, spinny tops, putty and slimes, masks and stamps…just to name a few! One more tip – if your guests are really young, where most of this stuff is either a choking hazard or totally beyond their scope of play (think up to 18 months) consider a party favour that is nice for the little one and that the parents might find useful – a novelty silicon teether, some skin friendly baby bath or a mini soother/security blanket to name a few. I hope you’ve found this two part blog to be a useful tool as you take on planning your next birthday party. Check back soon for Sprog & Sprocket’s FREE printable Party Planning Checklist! Just finding out about us – be sure to check out our portable playground or have a look at our cool softplay spaces. Still feel a bit stuck with your birthday party plan? Please get in touch! Simon and I have been helping people make their events memorable since 2011 and we look forward to helping all of our Sprog & Sprocket customers create parties and memories that will last a lifetime. You can fill out our contact form here or call us on 403 719 7776.